Now getting on Google My Business can increase your chance of showing up on Google’s local finder, Google maps, Google places, and in the organic rankings in general. Now qualifying local business can claim this free listing on Google and include information that they copy like name, address, phone number and a good business description. Additionally, over the past several months Google has made quite a few changes and developments on Google My Business including allowing and encouraging regular posts and updates which really helps to grab users’ attention. 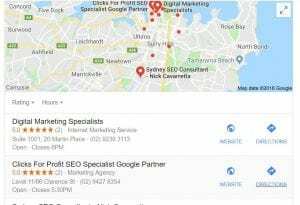 So to get onto Google My Business, just search for Google My Business here https://www.google.com/intl/en_au/business/ on your business name and when you click through, if you sign into your Google account, it will take you straight through to your page. If you can’t find a login for your Google My Business or you don’t have one set up there already, just let me know and I will try to help you out. Now, I mentioned before about business name. Make sure it’s descriptive and explains exactly what you do; that will help you quite a lot. Also, when you come to a reviews they’re very, very important for Google My Business. They can make a big difference. So get reviews, not all from friends, get them from different sources, preferably from customers as well. And remember to post updates. When your updates are due to expire, Google will remind you of that so you’ll get a little notification and it will start to pester you for them as well,which a good little driver. Okay, so that’s the main ideas about Google My Business. Just make sure you’ve claimed your free listing. That’s it for today’s blog update. I would be interested to speak with you about the services you offer.